A comedy-drama-buddy movie, The Dilemma creates a narrative mountain out of a molehill. 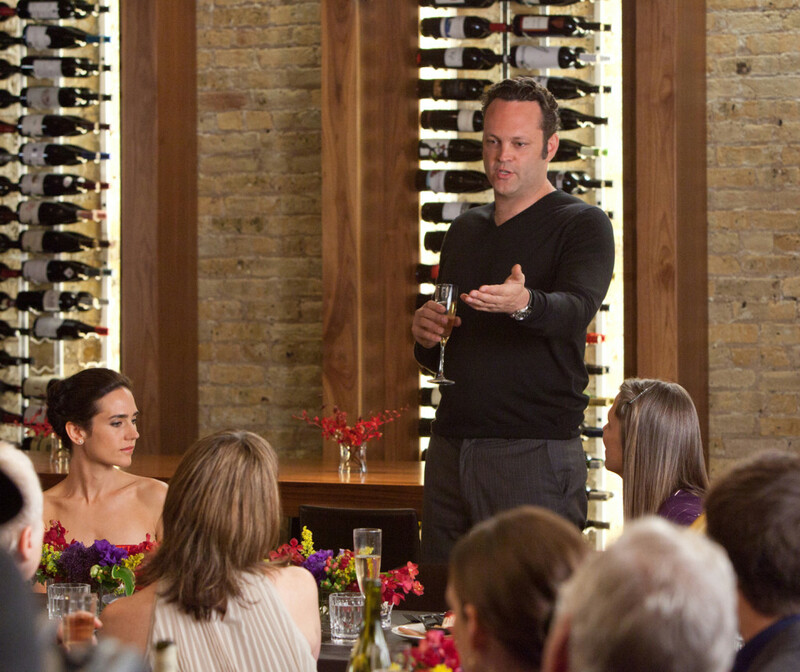 In Chicago, Ron (Vince Vaughn) and Nick (Kevin James) are business partners and long-time friends. Ron is a smooth salesman and Nick is a brilliant engineer, and they secure a lucrative but time-constrained contract to develop a high-powered electric engine for Chrysler. Nick is seemingly happily married to Geneva (Winona Ryder) while Ron, a recovering gambling addict, is in a long-term relationship with Beth (Jennifer Connelly) and thinking of proposing. With all the pressure on Nick to deliver the innovative new engine, Ron spots Geneva in a lovers' embrace with hunky Zip (Channing Tatum). Ron is caught in a dilemma, not sure if and when he should tell his already frazzled friend that his wife appears to be cheating. The secret starts weighing on Ron, affecting his own relationship with Beth. Incongruously directed by Ron Howard and written by Allan Loeb, The Dilemma may have worked as a 90 minute independent feature with a light and quirky touch. Instead, here it is bloated into two hours of torment, with an overpowering star name in every underwritten role as Howard strains every muscle to stretch the flimsy premise into an event. Even Queen Latifah shows up as a preposterous auto industry consultant. The entire film hinges on Ron suppressing a "your wife is cheating" conversation with Nick, and none of the surrounding fluff makes any difference: Ron's background as a gambling addict; his college-days romantic adventures; Nick's extracurricular massage parlour habits; Beth's parents' anniversary; the electric engine project and even the non-entity of Zip's character. All are undeveloped idea fragments spayed around to pad the running time and obscure the paucity of substance. The marginal positives include a few laughs and chuckles when Vaughn finds some form in his monologues. But ever here Loeb somehow introduces a borderline homophobic remark, and the continuous faux-macho football-infused banter between Ron and Nick is juvenile and tiresome. Other than being a wife and a girlfriend respectively, Geneva and Beth are provided with no exposition. Despite all the available talent on both sides of the camera, The Dilemma wallows in an exaggerated quandary of its own making.